My challenge to Christians—my plea, actually: Read the gospels and epistles carefully, meticulously, critically. Bring to these texts the same due diligence that you would apply when reviewing a mortgage or employment contract; you don’t want to be cheated or fooled. Let’s face it: pastors and priests are paid propagandists; yes, I keep saying this, because their urgent concern is to make all the stories come out right and banish doubts. Christians, you can do better than that: do the tough homework. The pews might empty fast—except for the folks who want to be conned, and don’t even notice that it’s happening. Your nice priest or pastor is a paid propagandist? How can that be? Will a Catholic priest explain passionately how Methodism is the right religion? No. Will a Methodist pastor urge his congregation to believe the Mormon or Muslim scriptures? No. Each church pays the pastor/priest to protect and defend its own version of truth. That’s what it means to be a paid propagandist. • If the writer/speaker makes extreme demands on followers. • If the writer/speaker makes vapid promises or extreme threats to pump up the cult. I can guarantee that your spreadsheet will be pretty full by the time you finish reading the gospels and epistles carefully, meticulously, critically. And it won’t seem so outrageous that I refer to Christianity as a cult. The evidence is right in front of you. The New Testament is Exhibit A. The earliest document in the NT, First Thessalonians, introduces us to the thinking of that champion cult fanatic, the apostle Paul. Since Second Thessalonians is commonly considered a forgery—created by someone writing in Paul’s name—it is his first letter that sheds light on his view of Christianity, i.e., as his hallucinations shaped the early faith. This article continues my series on the chapters of First Thessalonians. My article on the first chapter is here. Paul’s hallucinations had fired his enthusiasm (“…we have been approved by God to be entrusted with the message of the gospel…”), to convince as many people as would hear him in the Gentile world, that he knew the formula for salvation: Getting into the Jesus Kingdom when it arrived. Paul preached in a cult-eat-cult world; there were so many religious options to choose from. We can assume that the capacity for critical thinking was virtually nil among those who listened to cult preachers. There was no prevailing skepticism to slow down any of the competing religious advocates. As is the case today, people gravitated toward ‘what sounded right’—something they felt good about. He believed in his product. Which doesn’t mean at all that he was right; there can just be no doubt whatever that his visions—hearing from the dead Jesus whom he had never met—convinced him that he had glimpsed the divine realm: His direct line to God could be trusted. To those Christians who say, “Well, that’s good enough for us!” we can ask why they disbelieve thousands of other religious fanatics whose visions indicate divine realms that don’t include Jesus at all. Was the Text Tampered With? Now we come to three verses that require the rigorous discipline I recommended at the outset, i.e., read carefully, meticulously, critically. Scholars who do that are suspicious of vv. 14-16. Was it Paul who wrote these? Or were they added later—maybe a generation or so later—when someone thought it was a good idea to put in some digs about the Jews? Richard Carrier discusses why many scholars doubt that these words were written by Paul. • During the many centuries when the manuscripts were copied by hand, many interpolations were added to the original texts. The word of God has been tampered with so many times. Was all the tampering inspired too? • “God’s wrath” was one of Paul’s favorite themes; he considered it God’s default emotion. So if a scribe later did add these words, he faithfully imitated this aspect of Paul’s thought. How Can We Take Christianity Seriously? Satan prevented him from visiting? When Jesus comes, Paul will be able to brag to him about these Thessalonian converts he’d won? Christians, you’ve got to own the silliness. Theologians have rushed to the defense, e.g., these are metaphors, symbols of deeper meaning or lofty spiritual truths. “You can’t take this literally.” So much straining and tomfoolery to wash way the superstition and delusion. • Satan blocked our way: This was Christian thinking at the time Paul was engaged in his obsessive preaching of the Christ, and it was the same when Mark wrote his gospel, which could well be retitled, Jesus and the Demons. Folks were convinced that Satan and demons prowled the earth to inflict suffering. This was a theological maneuver to explain evil in God’s good creation. Satan even meddled in Paul’s travel plans. • Our Lord Jesus at his coming: For Paul, the Jesus Kingdom was not an abstract truth about inner spirituality (as theologians would eventually spin it). Paul expected Jesus to descend through the clouds to welcome the converts to the new cult, and it was not a far-off event. He was sure he would live to see the day, as we will see especially in chapter four of First Thessalonians. Mark has Jesus predicting it “before this generation passes away.” Paul and Jesus (or at least Mark’s version of him), were delusional, dead wrong. New Testament Christianity has been largely abandoned, especially as believers attuned to how the world works (no demons, no Jesus about to appear in the clouds) have resorted to endless reinterpretation. We know that Christianity has been reinvented countless time, and thus has splintered endlessly because no one can agree on what True Christianity is or might be. But pew-sitters the world over settle into their niche Christianities—not too bothered by how much they differ from other versions of the faith, and other versions of theism. Hey, as long as their niche versions include the eternal life gimmick, why would they care? Critical thinking is not required or welcome. 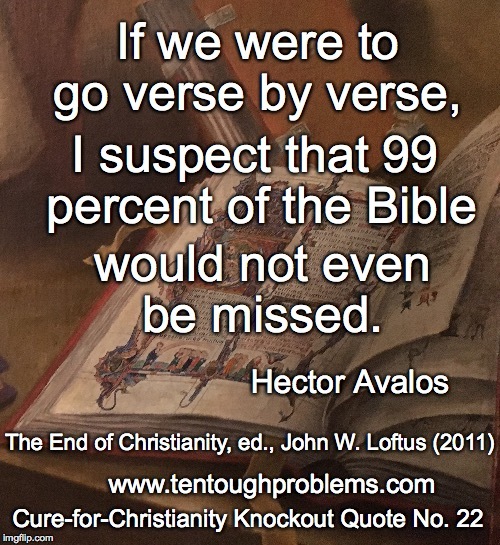 It’s an aspect of magical thinking that so much crap in our thousand pages of Bible is treated as ‘holy word of God.’ How long did it take for Paul to toss off his letter to the Thessalonians, only patches of which could be considered worthy of preservation? But for this very reason, atheists are glad to have the Bible, all of it, as evidence against the faith. So don’t reach for the scissors. Why not hold Christian feet to the fire? Maybe more and more of them will get tired making excuses and snap out of it. Critical thinking can give way to healthy skepticism. Christianity has been falsified—many times over—so isn’t it about time for this news to catch on?